Gonzaga’s Przemek Karnowski has been the biggest presence in the 2017 NCAA tournament. His 7-foot, 300-pound frame has helped lift Gonzaga to Monday’s national championship game against North Carolina. But back home in Poland, he’s overshadowed on the hardwood. Marcin Gortat, the Washington Wizards’ underrated starting center, hails from about two hours away from Karnowski’s hometown of Bydgoszcz. Gortat is the starter for the Polish national team, while Karnowski is his backup. He’s the most successful NBA player the country has ever produced, while Karnowski is the next big hope. Gortat and Karnowski are close. The NBA vet helped his younger, albeit bigger (33-year-old Gortat is 6-11, 240 pounds), countryman through rehab after a life-threatening back surgery last year. He’s hoping to see Karnowski, 23, in the NBA, though he talks with the same tough-but-caring tone you’d expect from an older brother. For The Win spoke with Gortat on Monday about Karnowski, Poland and pierogi. FTW: How long have you known Przemek? Gortat: Well, I’ve known him for about five or six years. The first time I met him was the time when he won second place for the World Championship Under-20 national team. In the final, they lost to the USA team that back then played Bradley Beal, my teammate; Andre Drummond; (Michael) Kidd-Gilchrist from Charlotte; and a few other guys. That was the time that I met him, when he became the second-best team in the world under 20. He was obviously a huge story back in Poland. He was the great new generation of basketball players that was supposed to lead our national team to success. So that was the first time that I met him, but since that day we’ve become very good friends. He’s like a brother to me right now. FTW: Have you been talking to him regularly during this Final Four run? Gortat: Well, I’ve been talking to him lately a little bit more. Most of the time, I’m not trying to bother him with unnecessary phone calls or unnecessary lessons or telling him what to do. He’s a very bright basketball player in a very good program, and the bottom line is, he knows what he’s got to do and what he’s got to focus on. Obviously I called him to congratulate him on top eight and then top four. And now obviously he’s in the final and I’m holding my fingers crossed for him, and hopefully he’s going to get a win. FTW: Poland has a long tradition of basketball, but you don’t have any countrymen currently in the NBA. Is it nice to have a Polish companion in the basketball community here? Gortat: It’s going to be a great feeling if he makes it into the league. Right now I’m by myself in the NBA from Poland, and I have to carry that responsibility for being No. 1 guy in my country and doing good work and being an example for young guys. But Przemek has a huge opportunity. He might make it to the NBA, and hopefully he’s going to make it to a team on the East Coast and I’ll see him more often and be able to help him out with a lot of things around the league. FTW: Do you think he will make the NBA? Gortat: Well, it’s going to be tough. It’s going to be tough. He knows this. The NBA is going in a different direction, different game than he’s playing right now. It’s not going to be easy for him, but there’s always a chance. Obviously, I’m cheering for him, I’m hoping he’s going to make it. FTW: Last year, with the back injury, he obviously had a really tough situation. Did you talk with him much? Gortat: Well, I spoke with him about that. He called me during rehab many times, and we were on the phone many times. It was a hard decision — he was really thinking about entering the draft last year already but decided to stay out and play out and try to improve more. Now he’s going to go to the NBA, try to make the NBA as a 24-year-old guy. He’s not going to be anymore 20 or 21 years old. So there’s going to be more expectations for him, and he’s got to be a more fundamental player now than he needed to before. We did speak a lot. He went through hell. At one point, he lost 30 or 35 pounds. It was crazy. He looked really skinny back then. It was a tough year for him. FTW: When you’re with Team Poland, he’s your backup. And I’m sure you go against him in practice. But you don’t really see many guys that big in the NBA. He’s a 300-pounder. Is he a challenge for you? Gortat: He’s a big, strong dude. It’s not like he’s out there standing and pretending. First of all, he’s a very skilled player. I can handle different things on the court, yes. With him being 300 pounds heavy, I can outrun him, I can outwork him. But at the end of the day, he’s very big and skilled. He’s definitely an NBA player talking about his skills and passing and shooting and ball stuff and knowing the game. His basketball IQ, he’s definitely an NBA player. He’s just got a big issue with his body. That’s going to be the question: Can he make the NBA because of his body? FTW: He says his favorite food is pierogi. What’s your favorite Polish food? Gortat: I could pick pierogi, too. I like mielone, which is like a burger. We have a few different meats. Definitely, overall, Polish food is my favorite food. We have a very healthy food in my country. FTW: How close can you stay to your Polish roots in DC? I’m imagining it’s a bit tougher for him in Spokane, Wash.
Gortat: Obviously it’s a different city, different state. I have a huge Polish community back in DC, obviously the Polish embassy and consulate. So I have a lot of people supporting me every day and every night. I have a lot of friends, and we also have a few different restaurants back in DC, so if I want to get Polish food, at the end of the day, I’m not alone, unlike Przemek is out there because he doesn’t have too many (Polish) people out there. FTW: Are you going to be watching the game tonight? Any prediction? Gortat: Yeah, I’m hoping he’s going to win. I’m cheering on him. I’m really counting on him. Time will show. GLENDALE, Arizona — He's one victory away from sparking Gonzaga to its first national championship, but a year ago, Przemek Karnowski couldn't tie his own shoes. Rem Bakamus handled the chore most days. He'd take a knee in the middle of campus and double-knot his teammate's laces as the 7'1", 300-pound Karnowski clutched an IV bag and balanced on crutches. Bakamus' kind deeds didn't end there. For nearly two months last winter, the fifth-year senior guard carried Przemek's (pronounced "SHEM-eck's") books to class. He assisted him in and out of his Ford Taurus and often ran his errands and fetched him food. "Thank God," Bakamus said, "I didn't have to help him wipe or anything like that." Bakamus chuckles as he recalls the story Sunday afternoon, a little more than 24 hours before Monday's showdown against North Carolina for the NCAA title. The Zags wouldn't be here if not for Karnowski—the fifth-year senior with a beard so long and ginger that it has its own Twitter account. While his teammates reveal entertaining stories about him in the University of Phoenix Stadium locker room, Karnowski holds court with other reporters outside of it. Apparently, "Shemmy" was quite the three-point shooter as a teenage guard back in Poland. "I used to be launching it!" he bellows in a Polish accent. "I'm serious, bro!" Anyone who has followed Karnowski's past year knows how refreshing it is to see the behemoth center beaming again—and, even more so, to hear the booming, energizing cackle that was long missing from the Zags' huddle. For a time, some feared it would never return. "There was a very high probability," head coach Mark Few said, "that he was not going to play basketball again." Indeed, after spending three weeks virtually bedridden in his Spokane townhome, Karnowski underwent surgery to repair a bulging disk in his back on Dec. 31, 2015. A few days later, when the meds had worn off and Karnowski was lucid, he asked his surgeon when he'd be able to return to the court. Basketball, he was told, should be the furthest thing from his mind. "My goal right now," the doctor said to Karnowski, "is to help you lead a normal life. My goal is to make sure you can walk again." Clearly, the journey would be long and arduous. Much like the one he'd already traveled. He wore running shoes with jean shorts and button-up plaid shirts during his first few months on campus. And more often than not, his teammates said, Karnowski put on one splash too many of offensive cologne. He attempted to play Polish rap music in the Gonzaga locker room, which wasn't well-received. And Karnowski despised the greasy burgers, tacos and fried chicken the players purchased late at night from fast-food joints, which were never a part of his diet growing up in Torun, Poland. "It's safe to say that Shem didn't have a ton of swag when he first came over here," Bakamus said. Still, the Zags loved their new teammate. Never a huge college basketball fan as a teenager, Karnowski had heard of tradition-rich schools such as Kentucky and Duke and Kansas. But he was unfamiliar with the Gonzaga until the staff started sending him recruiting letters before his final season of high school. At the time, Karnowski was considering skipping college altogether and signing with a European pro basketball league. But the more he began researching the Zags, the more he realized how much potential he had to develop under Few. Karnowski was particularly impressed with Gonzaga's history of success with bigs from other countries. Domantas Sabonis, J.P. Batista, Ronny Turiaf, Robert Sacre and Kelly Olynyk are among the foreign-born post players who have flourished in Spokane. "The more I read about it, the more it seemed like the perfect place for me," said Karnowski, who was also heavily recruited by Cal. "Once I left my official visit, I knew that's where I wanted to go." Just as they did on him, Karnowski made quite the impression on people at Gonzaga during his first trip to campus in the spring of 2012. And not just folks in the athletic realm. Jolanta Weber, the university's associate academic vice president, met with Karnowski during his trip. She said he was clearly jet-lagged from the 22-hour flight from his native country but was polite enough to fight back a yawn as she was briefing him on the school's academic principles. But something Karnowski said in that meeting stuck with Weber the most. When she asked him to name his No. 1 concern about moving to the United States, Karnowski's reply had nothing to do with basketball. Instead, he told Weber that he wanted to make sure he could excel in the classroom. As soon as Karnowski left the room, Weber phoned her husband, Gary, who is an accounting professor at the school. "We've got to get this kid to Gonzaga," she said. "He personifies everything this school stands for." Weber also had a keen interest in Karnowski because she, too, was born and raised in Poland. So for the next four-plus years, she and her family did everything they could within NCAA rules to help ease Karnowski's transition to American life. Some evenings, that meant inviting Karnowski over for a Polish dinner of breaded and flash-fried pork cutlets with potatoes, soup and maybe a piroshki. Other times, it involved a text to encourage him before a test or game, or a phone call to his parents back in Poland to comfort them when they missed their son. "People don't take the time to understand how much of a life change it is for someone from another country to come and live here," Weber said. "It's so much more of an undertaking than anyone realizes." While Karnowski adjusted to his new life away from the court—he was so insecure about his broken English that he waited until his junior year to take a required speech course—it didn't take long to realize that he would achieve success on it. Karnowski backed up Olynyk, an NBA lottery pick in 2013, as a freshman before averaging double figures in scoring the next two seasons as Gonzaga's starting center. Even though he looked slow and unathletic at times, Karnowski's ability to pass out of double-teams and his physicality in the paint impressed NBA scouts—not to mention the teammates that went up against him in practice. "It's like running into a brick wall. You're not going to move him," said backup center Ryan Edwards, who at 7'1" and 295 pounds is almost identical in size to Karnowski. "I can't imagine not being his size and going up against him. If I were a 6'9" or 6'10" post, no thanks. I would not want to deal with that. "He hurts your body. You'll have a broken rib after the game or something. I've got bruises after every practice. It's intense." After helping Gonzaga reach the Elite Eight as a junior in 2015, Karnowski entered what was supposed be his senior season determined to lead the Zags to the program's first Final Four before being selected in the NBA draft. Everything seemed to be lining up perfectly. And then, during a routine shootaround on Dec. 1, the giant fell. Karnowski still squirms when discussing the pain that would soon follow. "I don't wish any of that to happen to my worst enemy," he said. For nearly three weeks, Karnowski rarely got out of bed. When he needed to use the restroom each morning, Karnowski—unable to lift his upper body from the mattress—rolled onto the floor and crawled. Across the carpet he'd go, first to grab a crutch with one hand, and then toward the door, where he'd grip the knob with the other hand as he pulled himself from the ground and to his feet. Some days, he said, the entire process took an hour. "I'm like, 'Przemek, you've gotta get out of bed,'" assistant coach Tommy Lloyd said. "'You've gotta take a shower, you've gotta start feeling better.' I'm having the hard talk with him and he's like, almost tearing up." Karnowski couldn't bend down and duck into the shower at his one-bedroom townhome, so on several occasions, Lloyd helped him get into his Toyota Sequoia—hardly an easy task—and drove him to the athletic complex so he could use the more spacious facility. As the weeks went by, Karnowski's back spasms intensified. There were nights when he began sweating profusely. Karnowski had undergone an initial MRI following his tumble on Dec. 1, which showed the bulging disk. But when he returned for a second MRI after things got worse, he leaned that a staph infection had developed in his back and spread to his left leg. "The doctor comes out and is like, 'This can't even be the same guy,'" Lloyd said. "'From two weeks ago to now, how is this so different?'" The source of the infection was never discovered, but it took its toll on Karnowski, who had an abscess on his left shin measuring 10 centimeters long by three centimeters wide by three centimeters deep. "A nasty puss pocket," Lloyd said. An emergency surgery was scheduled to halt the infection. Nervous as Karnowski may have been, he tried to remain upbeat—even cracking a joke when his anesthesiologists told him they were graduates of BYU and Duke. "No rivalries today, guys," he said as he was prepped for the procedure. "We're all friends here, right?" A few days later, doctors told Karnowski his recovery could take up to 10 months. And they offered no guarantees when he asked if he'd be able to play basketball again. Weber and her family were at the hospital every day until he was released, consistently providing updates to his parents back in Poland. "I just wanted to hug him and take care of him," she said. "It'd be a scary situation for anyone, much less a 21- or 22-year-old whose parents were 6,000 miles away in another country." Still, Karnowski was anything but lonely in the hospital. So frequent were the pop-ins from players, coaches and fellow students that nurses had to tell him to cut the visits short and get some rest. With such a long recovery and an uncertain future, Few became concerned about Karnowski's mental health. Not to mention his physical well-being, as he dropped from 310 pounds to 238 in a single month. "I was really worried about depression and things like that," Few said. "Emotionally, he wasn't in a great place. So going from those dark days to right now, it literally is miraculous, and I'm not using the term lightly." Karnowski, though, vows he never became depressed—partly because people on campus wouldn't let him. Whether it was Bakamus trying his shoes and carrying his books or fellow students stopping him on campus for some kind words and a selfie with him and his IV bag—which he carried for four months—Karnowski's spirits elevated more and more with each passing day. "One day I was playing basketball," he said, "and the next day, I couldn't get out of bed. It taught me a lot. It gave me a different perspective on my life. Take everything with a smile on your face, because maybe the next day you won't have [that opportunity]." The further he got into his rehab, the more it appeared he'd indeed get another chance to play. Doctors told him it'd be 10 months before he could run or jump. Karnowski was doing both after seven. Near the end of last summer, he sent Bakamus a video of himself dunking for the first time since the injury. "That was the first big moment that I can remember where I was, like, 'OK, he's getting back to normal,'" Bakamus said. "He stayed so upbeat the whole time. It made me proud to be his friend. It was a mental and physical grind." Doctors cleared Karnowski to return to full contact drills in October, just before the start of official workouts. The very first week of practice, during a warm-up drill, he felt spasms in his back. "I thought, 'OK, is this going to be a recurring theme?'" Lloyd said. "We gave him a day off and, for a while, never had him practice more than two days in a row. "Since December, he hasn't missed a practice. He's done everything everyone else has. He's been great." Along with his 12.3 points, which rank second on the team, Karnowski is averaging 5.8 rebounds and an eye-popping 2.0 assists for Gonzaga, which is 37-1 and in the national championship game (and Final Four) for the first time in school history. Although he's considered a fringe NBA prospect, there's no question Karnowski will make money playing basketball somewhere next season, most likely overseas. Karnowski won't think about any of that, he said, until after Monday's game against North Carolina. The Tar Heels feature one of college basketball's top forwards in Kennedy Meeks, who had 25 points and 14 rebounds in Saturday's semifinal victory over Oregon. At 6'10" and 260 pounds, Meeks isn't quite as big as Karnowski, but he's more mobile. "He's a great player," Karnowski said of Meeks. "I give a lot of respect to him. But I'm not just going to go out there and do nothing." Whatever happens, people in Karnowski's native land will be watching. For the first time in history, he said, a Polish television station will carry Monday's NCAA title game live, meaning it will be available in every household in the country. The only problem: It tips off at 3 a.m. in Poland. Karnowski's father, however, won't have to get up that early. Bonifacy Karnowski traveled from Poland to see his son play his final two collegiate games, landing in Phoenix around 1 a.m. Saturday. His face was featured multiple times on the massive overhead video scoreboard during Gonzaga's win over South Carolina, and it's likely that will happen again during Monday's championship tilt. Bonifacy was Karnowski's coach growing up, so the 7-footer would love to make his father proud by capturing the NCAA title. He wants it for his teammates, too. He wants it for his coaches, for his school and, yes, for himself. Win or lose, Karnowski's reputation at Gonzaga won't change. He'll always be one of the most loved players in Zags history. And, even more so, one of the most respected. "We are going to miss him so much," Weber said. "The greatest gift to me is that he doesn't need us anymore. He's become so gritty and determined and confident—and he's comfortable in this environment now. "He's assimilated into his new life." 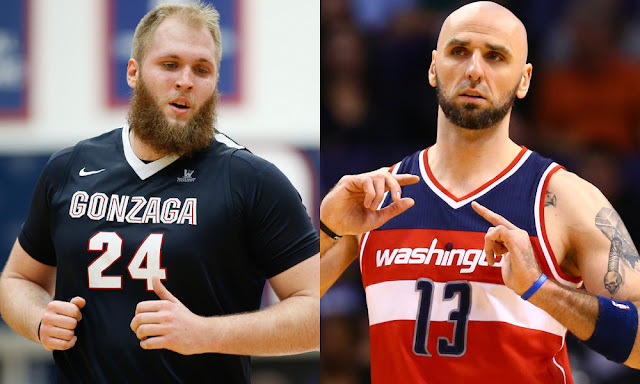 0 Response to "Wizards' Marcin Gortat gives an honest NBA assessment of 'brother' Przemek Karnowski"